I’ve got a very good data set for UVI 0 to about 7.5. Just waiting for the sun to get higher in the sky so we can get some 8-11 UVI days. 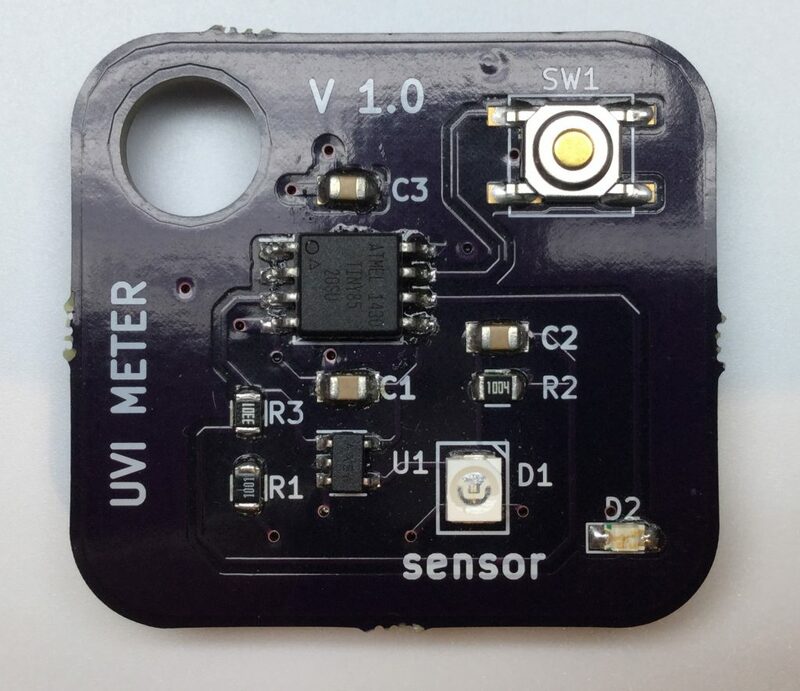 Here’s the older UV Monitor v 1.2. 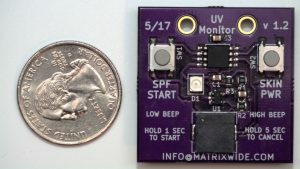 This one used the same GUVA-S12SD UV sensor, but used it to calculate an accumulated UV dose and warn the user when they are about to get to a dose causing sunburn. Primary issue here was inability to control orientation and therefore the indicdent UV level. Pretty much the only way to use it and get accurate results was to attach it to the brim or top of a hat. 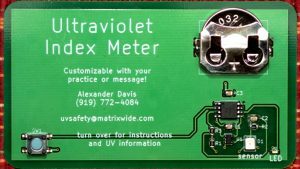 I’ve been working on a simple solution for ultra-violet exposure awareness and mindfulness. 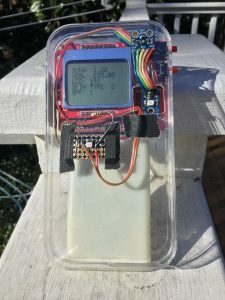 Previous solutions offered dose monitoring https://hackaday.io/project/5684-sunburn-monitor, but the main problem here is the difficulty in keeping it oriented so as to achieve proper incidence – hard to to in a wearable. Also, the reality is if you just put on sunblock or wear protective clothing, you don’t have to worry about it. 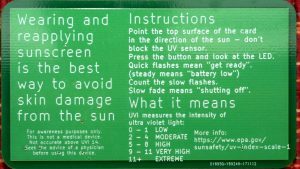 So the main problem is mindfulness; if you get people thinking about UV exposure maybe they will do a better job of taking action. The latest device takes this into account. All it does is measure the current UVI. It’s cheap, pockeable, and has room for instructions and medical provider/sponsor info. Prototype production is underway with a goal of 20 boards. Sounds pretty small, and it is, but I’m hand-applying solder paste to pads and acting as my own pick-and-place machine. It takes time to populate a board! Later runs will either offshore the whole board or at least panelize and use a solder paste stencil. My brand-new WordPress install was letting me upload images just fine, but would only show them to me in editor mode. Otherwise it displayed an “?” icon. My apache2 2.4.5 requires “require all granted” directive, in addition to “allow from all”. If you’re looking for our photos, we’ve moved our more recent stuff to imgur. Contact us if you’re looking for really old stuff.